The world cup champions, also known among fans as "Les Bleus", will arrive at Charles de Gaulle Airport north of Paris at around 3.30 p.m. 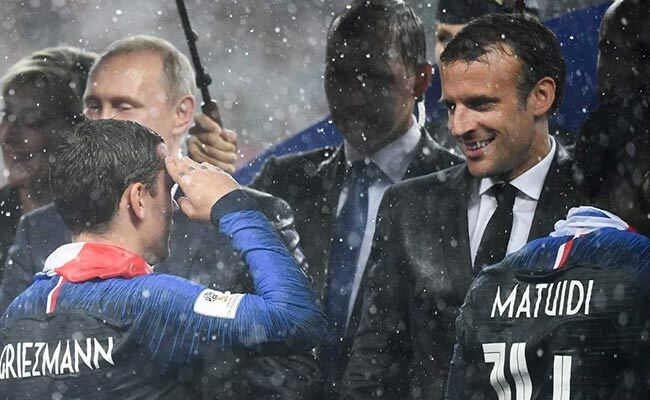 The French president watched the world cup final on Sunday at the Luzhniki Stadium in Moscow. French President Emmanuel Macron will hold a reception ceremony on Monday for the national football team at his Elysee Palace official residence to celebrate their victory against Croatia at the 2018 FIFA World Cup. The world cup champions, also known among fans as "Les Bleus", will arrive at Charles de Gaulle Airport north of Paris at around 3.30 p.m., reports Efe news. The group will then move along the Champs-Elysees on a bus before meeting Macron at the Elysee Palacer. The French president and his wife Brigitte Macron, who watched the world cup final on Sunday at the Luzhniki Stadium in Moscow, will hold a reception ceremony in honour of the team in the gardens of their residence. Families of the players will be invited to the ceremony along with more than 1,000 children, 300 athletes and members of the football clubs for which the teammates play, according to a statement from the presidential office. To guarantee the security of the parade on the Champs Elysees, the police announced a special deployment of 2,000 officers and armed security guards in the capital, and added that more details on the security protocols will be provided on Monday morning. Over the weekend, authorities deployed over 4,000 security officers in the Compo de Marte area in Paris, where more than 90,000 fan gathered to watch to game, and another 12,000 officers across the capital. France beat Croatia 4-2 at the finals on Sunday. This is the second World Cup win for the French team.